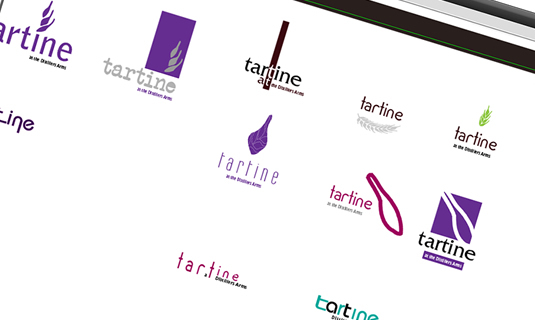 Gary Stewart approached Chew Design and asked me to create a logo and branding for his new restaurant, “Tartine”. This would be a new restaurant situated within the already established Distiller’s Arms Pub in Bushmills. Gary had just bought the premises and wanted to obviously change things about a bit and give the business a fresher feel. and aesthetic work done at the outside main entrance. Beyond that, Gary left all design work to me. I had free rein. This can sometimes be a blessing or a hindrance but in this case it helped things along immensely. After a few brainstorming sessions and a quick bit of research into the Distiller’s Arms I came came up with a number of ideas. 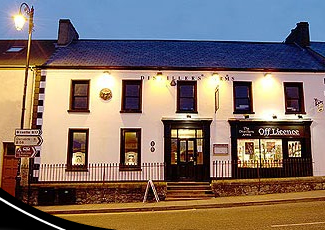 Many would link to the historical ties of the actual pub, it having been the home of the Bushmills Distillery owners for many years. The pub had obviously taken its name from this bit of history and I felt that Tartine could possibly benefit from this as well. Upon receiving the first batch of ideas Gary immediately picked one that he preferred over all others. It was the logo with the barley symbol that caught his eye. The barely symbol comes loosely from the historical ties the pub has with the Bushmills Distillery. Whiskey is made there and barely is used to make whiskey. Gary liked this logo and so I set about developing ideas about colour, layout, spacing and font around this chosen design. Gary was very specific about colour. 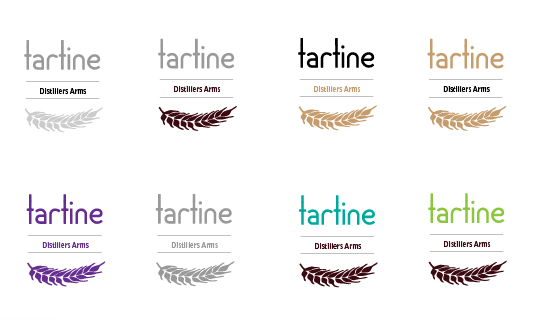 He wanted the logo to tie in with the new interior colours of his restaurant and also compliment it. He mentioned plum, purple, aubergine, greys, black as colour preferences and I certainly stuck to this set of requirements. Experimenting with colour allowed the design to breathe and develop. I sent through a number of design alternatives. Gary was delighted with these samples and became very specific about how he wanted the logo to look. The font needed a little work. Gary liked the idea of elongating a few letters. This would enhance the logo further but we had to be careful. Too much manipulation would make the text and font unreadable. He liked gray and aubergine. He also wanted me to try placing the logo on an oval shape. 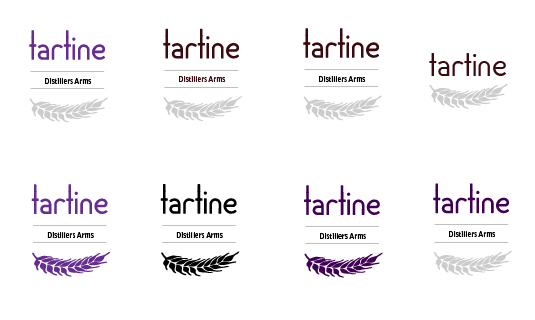 This would give the design a little more consistency and perhaps tie it in with the theme of its parent pub, the Distillers Arms. I experimented with circular and oval shapes and sent through another batch of samples. We had pretty much nailed it with this last batch of samples. Gary picked one that caught his eye and I finalized it for him. The logo is simple, light in colour but definitely effective. It sets the mood almost immediately for Gary’s new business venture. Gary was delighted. “ You did a great job! 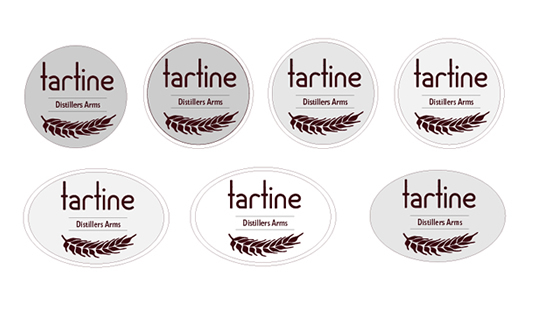 Things are beginning to heat up with Tartine and im now at the stage where i need more hours in the day. Another happy client. Another great logo!